Semi-double, mature plants double flower form possible. 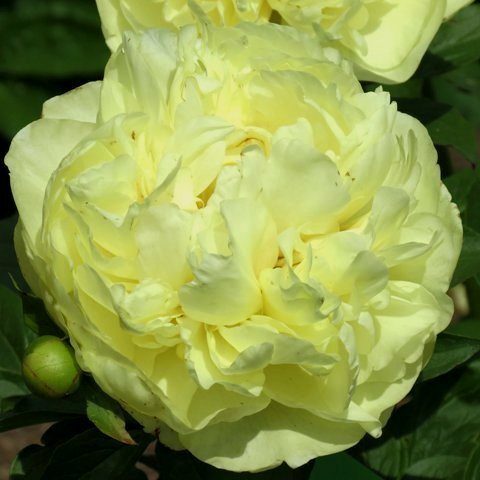 Striking large, lemon yellow flowers, petals of heavy substance hold well in the garden, side buds extend the flowering period. Medium height stems are strong and stand well against the weather while in flower. The medium size bush and deep green foliage remain attractive in the landscape. Annual increase of stems is not fast as some cultivars, the pay-off being attractive flowers from first bloom of young plants. Herbaceous Hybrid. Parentage: 'Salmon Dream' x [Reath No. F-3: 'Cream Delight' x 'Moonrise']. Tetraploid, seed and pollen fertile; as parent has already produced wanted qualities in its progeny.